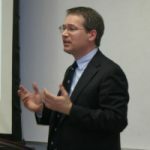 We kicked off our 2016 Travel Lecture Series with a series of lectures by Professor Philip Seaton (Hokkaido University), one of the key researchers working on an ongoing project entitled “International Comparative Research on the Spreading and Reception of Culture through Contents Tourism,” and producing the International Journal of Contents Tourism. On March 10, Professor Seaton spoke at Renison College, University of Waterloo to a packed room of students and faculty. He explained the differences between Heritage Tourism– travel directly spurred by historical interest– and Contents Tourism– travel initiated by an interest in historical events filtered through a pop culture lens. He detailed the striking tourism gains for local communities resulting from the reemergence of historical figures in anime and games– such as Sengoku BASARA— and TV dramas– such as Massan, the NHK serial based on the story of the Japanese founder of Nikka Whisky and his Scottish wife. The following evening, Professor Seaton was joined by Professor David J. Telfer (Brock University) at the Ted Rogers School of Management, Ryerson University for an evening of talks on Special Interest Tourism. Professor Telfer spoke about the development of culinary tourism in the Niagara region and the effects on visitor numbers, with a particular focus on the impact on Japanese tourist figures. Professor Telfer’s gastronomical slides made more than a few mouths in the room water, and no doubt encouraged some of those present to play their own role in increasing visitor numbers to Niagara’s culinary belt. 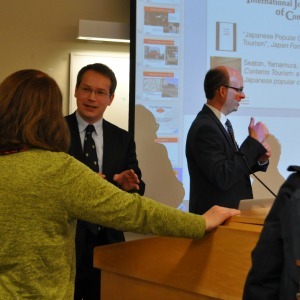 After his two Ontario talks, Professor Seaton flew to Vancouver, where he delivered his final lecture on Pop Culture, History and “Contents Tourism” in Japan at UBC’s Centre for Japanese Research.